Main Attractions: Historical home, quiet walks, artistic influences. 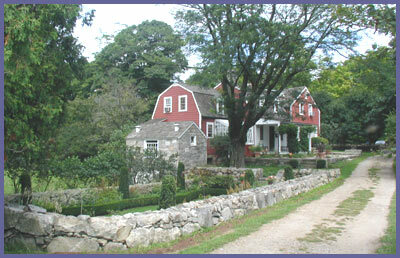 Weir Farm located in a wooded part of Ridgefield, CT is a small, picturesque parcel of land surrounded by suburban homes. It also happens to be a national historic site and world renowned in the art community. At Weir you can combine love of hiking with an appreciation for impressionist art. American impressionist, John Weir, lived on a farm here which provided endless inspiration for his artwork. His family and friends also produced significant artwork here and that art lineage was past on to others. The farm is preserved in order to educate and enlighten folks concerning a way of life long since gone but the resident artists and museum and education center keep the artistic inspiration alive. As far as the hiking? Well, it's not a place with miles of trails nor are there any magnificent vistas or overviews. But the nature trails take you along some nice opens fields, through peaceful forest, and to a serene pond that continues to inspire nature lovers and artist alike. Just walking around the site is enjoyable even if you don't venture off for a hike. The grounds are well maintained with beautiful gardens, wildflowers, magnificent trees, wildlife, historical buildings, and quiet, peaceful trails that seem to take you back in time. Throw in world class artwork at the museum and you have a special place that's worth a visit. Your best bet is to take some time and check out the visitor center in the main house right across the street from the parking lot. You can learn about the farm, get your bearings straight, and use the map to plan out your hike. There are several trails and you could easily do all of them in a few short hours. Some go past the main open field and into the woods, others wander off in varying directions and highlight classic New England rural life that once was. The pond hike is the farthest of all the hikes at Weir and if you love quiet, calm, serene settings (who doesn't!?) then it's a great spot to visit and relax. Bring your camera or art supplies because the place is one giant artistic inspiration and you'd be joining in on vide that pervades. You're sure to come across an artist somewhere if you venture out on the trails. Folks come from all over the world come to Weir Farm because of its historical significance and the natural beauty that abounds. Your best chance to catch a glimpse of wildlife or a unique scene is dawn or dusk. Early mornings and evenings bring out certain animals that might be tough to spot during the day and the "golden light" that all film makers, photographers, and artists utilize is extra special at a place like Weir Farm. Though Weir Farm is small and the trails are relatively short, it's still a place you'll want to visit and explore. It's a great place for those just getting into hiking or to bring little ones who are not old enough yet to take on trails. The main area alone is a site you can wander around and explore. The homes, barns, huge old trees, and gardens should capture your imagination if you let it. Another nice thing about Weir is that it's just 5 miles from the historical center of Ridgefield. Ridgefield is steeped in colonial history and there were some very significant battles fought here during the Revolutionary War as this nation was formed. The town has done a wonderful job of preserving that history as well as providing a nice downtown area with all the modern conveniences. Main Street is a nice hike in and of itself. You can walk up to the area with colonial homes and then come back for a bite to eat or shop. Directions: Take Route 7 to the Branchville district in Ridgefield. Route 102 meets Route 7 here and you hop on Route 102 that heads towards Ridgefield Center. A few hundred feet up Route 102 you will see the sign for Weir Farm. 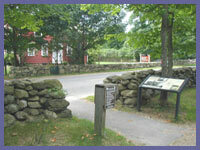 Take a left onto Old Branchville Road (if you're coming from Ridgefield Center hop take Route 102 off of Route 35 (Main Street) and 5 miles later will be the sign for Weir Farm). Head up Old Branchville Road and when you come to a stop sign where Old Branchville and Nod Hill Road meet, take a left onto Nod Hill Road. Nod Hill winds through a neighborhood and a few minutes later you'll come upon Weir Farm. Parking is on the left. Visit Weir's Official website and click on the "Plan Your Visit" link for their directions and other info.